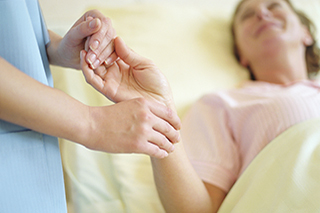 Many nurses feel unprepared to provide the spiritual component of end-of-life care. Nurses are called on to provide a holistic approach and help with physical, psychological, and spiritual components. However, the researchers write that spiritual care is largely missing from nursing care, and subsequently many nurses feel unprepared to provide spiritual care. The researchers surveyed nurses working at 6 health facilities in eastern South Dakota. They analyzed the narrative descriptions from 10 experienced palliative/hospice care nurses and also conducted individual, face-to-face interviews (45 to 60 minutes long). For this study, the researchers started with the same lead-in questions. They recorded the audio and had it transcribed verbatim. “Further testing of the tool is needed in more diverse settings and with interprofessionals. The tool could feasibly be used with students as well as with practicing clinicians to test pre/post knowledge in conjunction with an educational intervention specific to palliative and end-of-life communication,” said study investigator Mary Minton, PhD, CNS, CHPN, associate dean for Graduate Nursing and associate professor in the College of Nursing at South Dakota State University, Brookings.